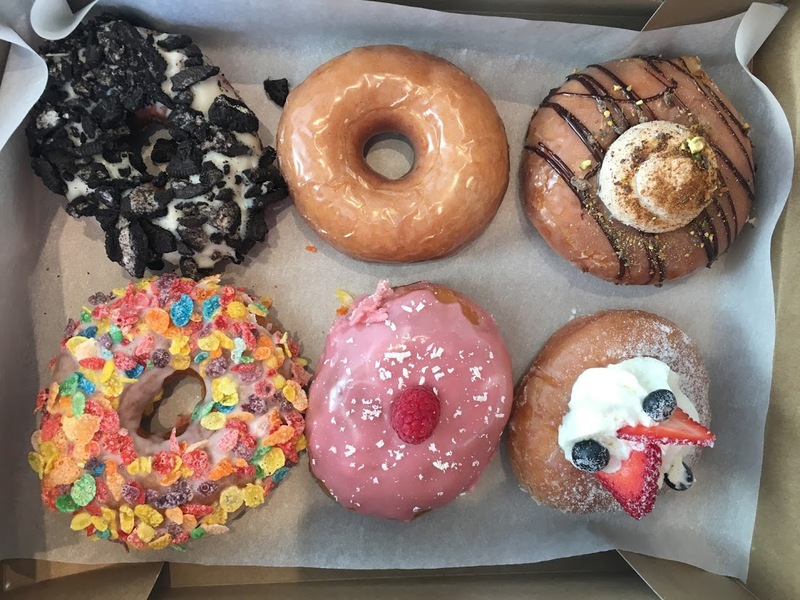 The newly opened Donut Bar offers a variety of unique flavors. One wall is decorated with a large neon sign and pictures in vintage looking gold frames. 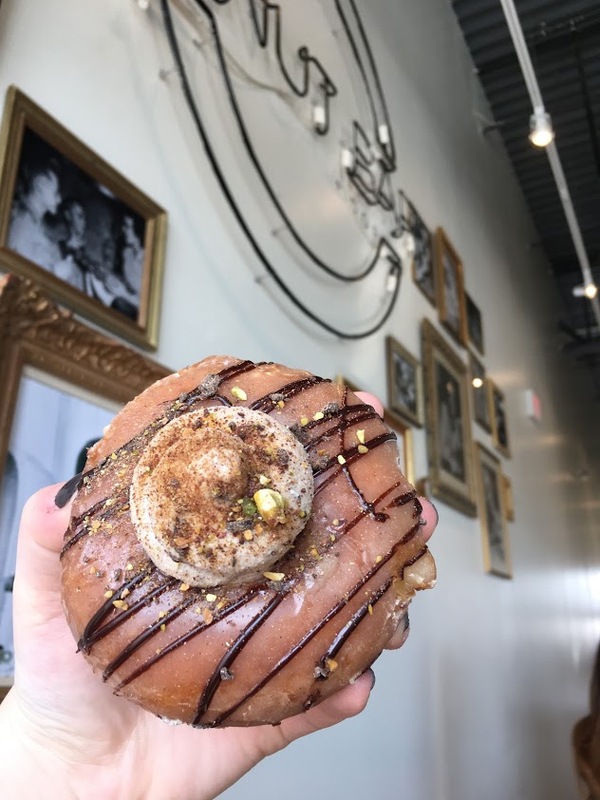 With its new location on Big Beaver Road, Donut Bar has brought the joy of gourmet donuts to Troy. Sophomore Akshaya Suvarna was very excited about her first time coming here and first heard of the Donut Bar on Snapchat. “There were all of these different weird flavors and I was like, I gotta try it!” Suvarna said. The atmosphere of the location was modern with a hint of vintage from the gold frames. It was really busy on the Saturday morning we stopped by on, and throughout our whole visit the few tables they had set up were all full. Due to the limited seating, it is definitely more of a pick up your order and go kind of place. We ordered eight different donuts and rated them, so you know which ones are their worst, and their best. We also rated a latte just for good measure. Enjoy! 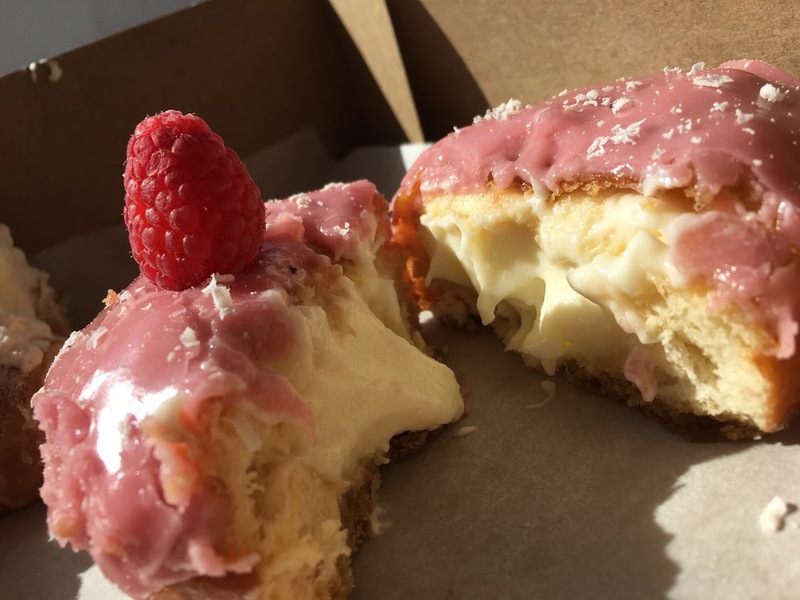 Tres Leches: The one that made Donut Bar famous. Presentation: I thought it had a very traditional look with the stack of cream, fruit and powdered sugar, although the fruit added height which was nice. Taste: The texture of the airy cream, the taste of the acidic fruit and the chewier glazed donut all together tasted exquisite. Fruit is always a nice addition for some acidity to cut through all buttery flavor. OMG Factor: The best part was the whipped cream. I was kind of surprised though since the only thing that suggested this donut was related to Tres Leches was the whipped cream. There was no heavy milkiness which is what a tres leches cake mostly is. This donut was great, but I was expecting more. This donut was covered in a crunchy topping. Presentation: I felt like the presentation was very unique with the 3D toppings. Taste: It was a little bit more on the salty side. So, it’s good if you’re looking for something that isn’t overwhelmingly sweet and onenote in that sense. OMG Factor: The part that most surprised me was the powerful saltiness. Usually, it’s more muted even in salted caramel, but I’d say it was one of the most prominent parts of the donut. The crunchy topping was also a surprise, however, I think I prefer my donuts without a crunch generally speaking. Presentation: The presentation was pretty classy and traditional, it was also more spherically inclined compared to other donuts. That being said it still could be better, it was okay, but definitely not at the same level as their other donuts which tells me they are capable of doing better. Taste: With the underperforming in the presentation department, I was expecting this donut to taste incredible. 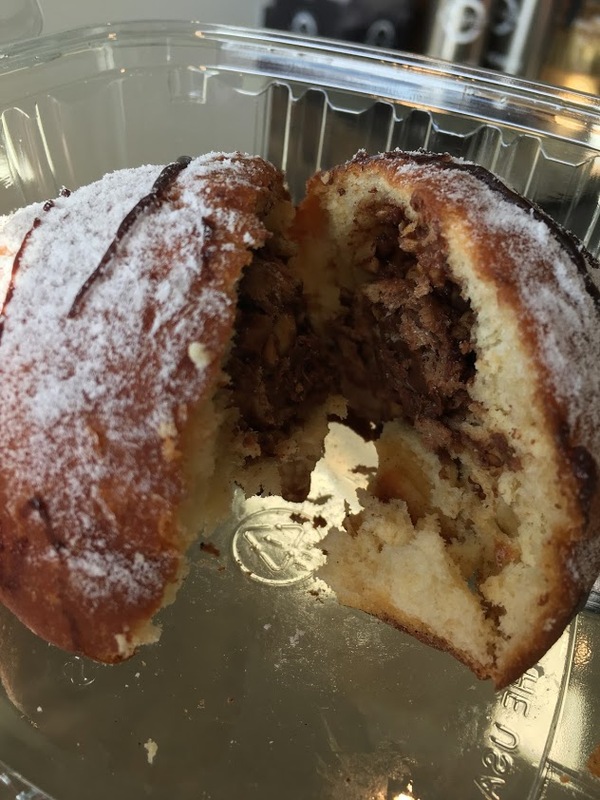 I was hoping that instead of filling the donut with a chocolate hazelnut spread like Nutella, it would be filled with a more specialty and gourmet chocolate filling. Instead, they stuck an actual Ferrero Rocher in it. Number one, half the fun of a Ferrero Rocher is the extra packaging, which we are already being deprived of. Number two, to say this donut was a little on the dry side would be an understatement. It was heartbreakingly dry, and the experience of eating dry donut along with the crispy wafer component of a Ferrero Rocher was an unforgettable experience in all the worst ways. The actual donut itself also wasn’t glazed, and therefore wasn’t very sweet at all. OMG Factor: The disappointing “filling” was an unfortunate surprise. The donut was covered in Fruity Pebbles. Presentation: This one gets an A+. The fruity pebbles added great texture and color. Taste: I’ve never had fruity pebbles before, but it tasted like any sugary cereal on top of a donut. Nothing super special. Something should’ve been there to kind of meld the cereal flavors with the donut flavors, like a filling. 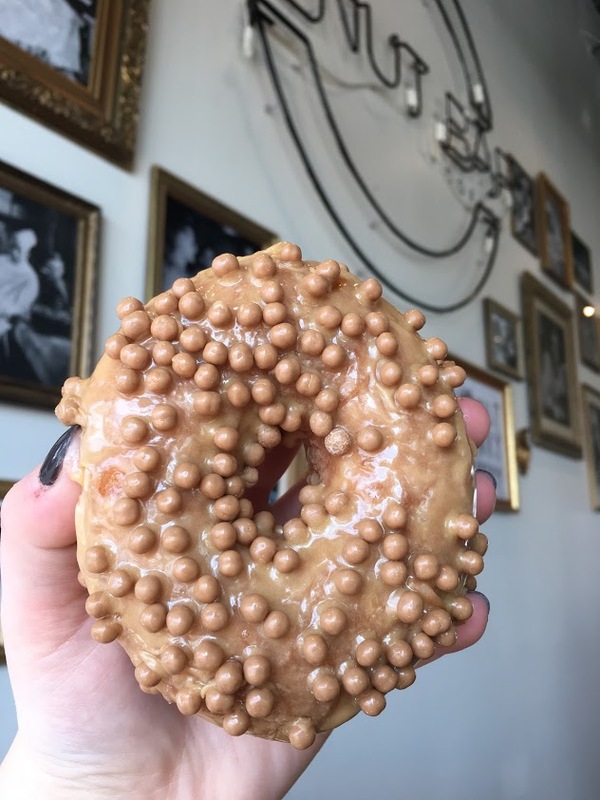 It just seems like anyone can throw cereal on a donut. All in all though, it had a pleasant flavor, although I’m still not sure how I feel about crunchy donuts. OMG Factor: The flavor combination, I’ve never had cereal with any type of donut before. Presentation: The presentation was fun, no one can say no to a donut covered in Oreos. The only reason the fruity pebbles donut was better in terms of looks was that the cereal added color. Taste: This didn’t just taste like Oreos thrown onto a glazed donut. Normally, Oreos tend to disintegrate in your mouth, with this donut the Oreos disintegrate into your mouth as you chew, melding everything together. OMG Factor: The best part was how the Oreo disintegrated into the donut in my mouth. The black specks in the glaze are from the vanilla bean used to make it. Presentation: What I liked best about the presentation was that you could see the vanilla bean in the glaze. 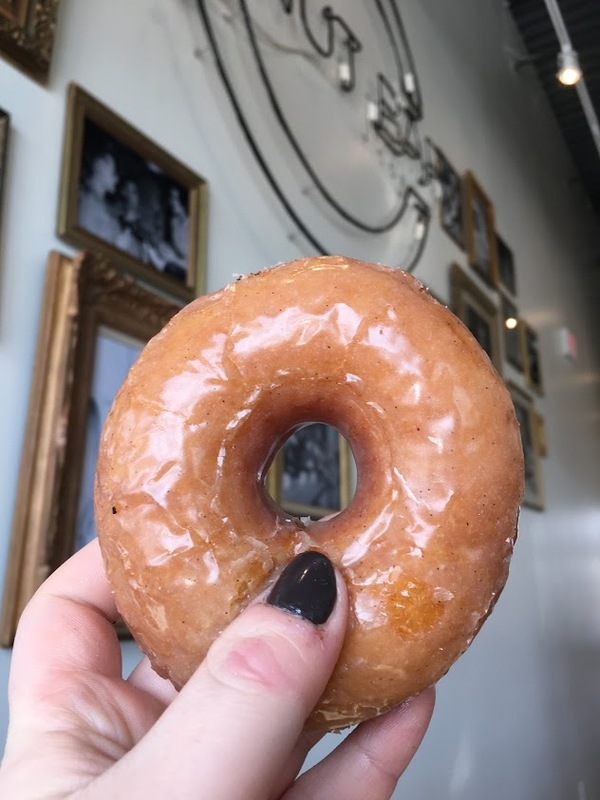 The vanilla specs made it seem more gourmet; it was also comforting to know that the glazed with real ingredients rather than artificial flavoring. Taste: Nothing extra, but it was great, just tasted like a normal glazed donut, maybe a little more buttery and less artificial but I really couldn’t taste a difference due to the real vanilla bean. I will point out that I think for a good glazed donut, I’ll go to Krispy Kreme just because of how those donuts deflate in your mouth. This donut wasn’t necessarily cakey, but it also didn’t deflate. OMG Factor: I was pleasantly surprised to see the actual vanilla bean specks in the glaze. 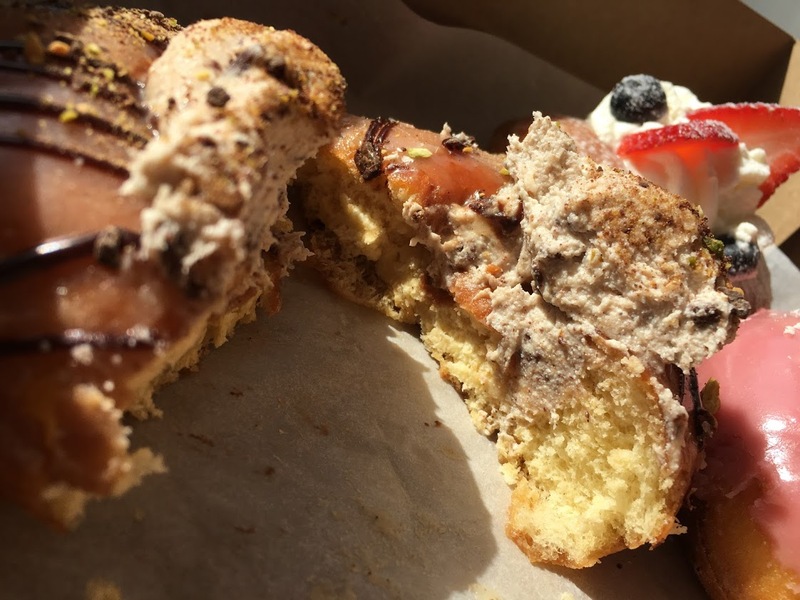 The donut had cinnamon flavored cream on top, as well as a sprinkling of nuts, and a drizzle of chocolate. Presentation: Like a couple of others, it had a pretty traditional look. Taste: I’m not a huge fan of cannoli, but I’ve never had a cinnamon flavored cannoli. There was a strong cinnamon flavor I wasn’t a fan of, I like cinnamon sugar, but this had a more cinnamon spice, to almost a pumpkin spice flavor. OMG Factor: The most surprising aspect for me was the cinnamon flavor. I also wasn’t loving the fact that there was even more of the cinnamon cream filling inside the donut. 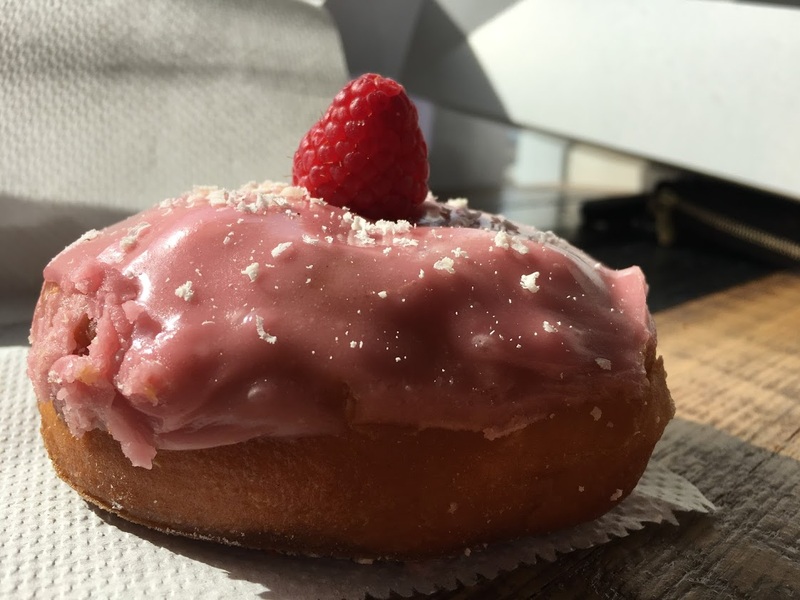 The frosting was pretty in pink, and topped with a raspberry. Presentation: The presentation was cute, and the glaze was a really pretty shade of pink. Taste: This donut was terrible. Terribly artificial. Artificial to a whole other level, almost to the point where it was perfumey in a bad way. The intense, loud, fake flavor takes over your whole mouth. OMG Factor: I was absolutely shocked that this donut tasted so fraudulent, since the other ones were all so much higher quality. One worker told us this was the donut that made Donut Bar famous. Presentation: I thought it was really traditional as well. The strawberry and blueberry added a nice pop of color. Taste: I thought it was really good! It was light and airy and not heavy at all compared to other donuts. OMG Factor: The fruit for sure. Presentation: I thought it was really cute! The little balls on it really add to the presentation. Taste: All around it was pretty good, the balls gave it a nice crunch and you could definitely taste the caramel and sea salt. Not as sweet as I expected it to be, it could be a little sweeter, especially because it’s a caramel donut, both things you would expect to be sweet. The inside was filled with a single Ferrero Rocher. Presentation: It was pretty plain, just a ball with powdered sugar on it. Taste: Not that good and extremely dry. Would not recommend. The Nutella in the filling was good though, but it added to the dryness and chewiness. A Ferrero Rocher chocolate was in the middle of the donut itself but it, again, just added to the dryness of the donut. There was no cream in it at all which left me desperate for a cup of water. It was my first time ever eating a Ferrero Rocher chocolate and I expected to be wowed, based on how good the other donuts were, but this donut was very underwhelming and I definitely wouldn’t order it again. I could see how this donut could possibly be someone’s favorite, if you like dry chewy donuts and Ferrero Rocher chocolate that is. 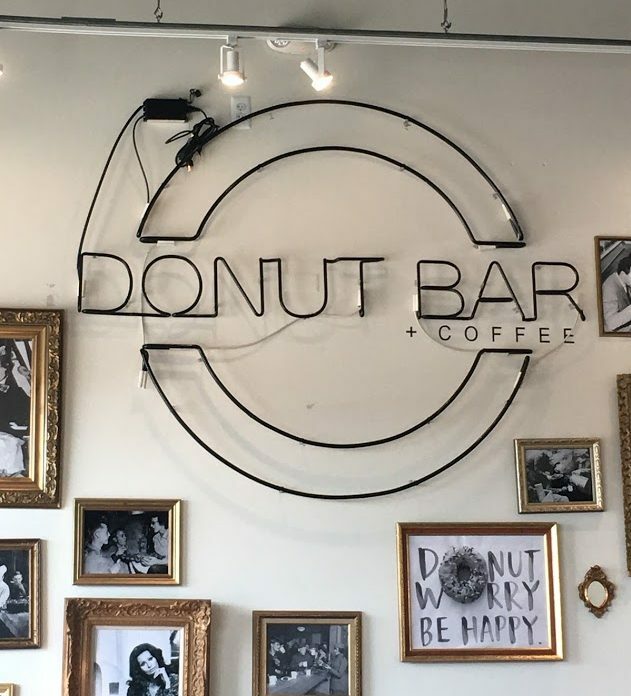 But for the most part, I think me, Murryum and a lot of others an agree that this donut was quite unforgettable (in a bad way) and would not be the reason I would go back to the Donut Bar. Presentation: One of my favorites for presentation. 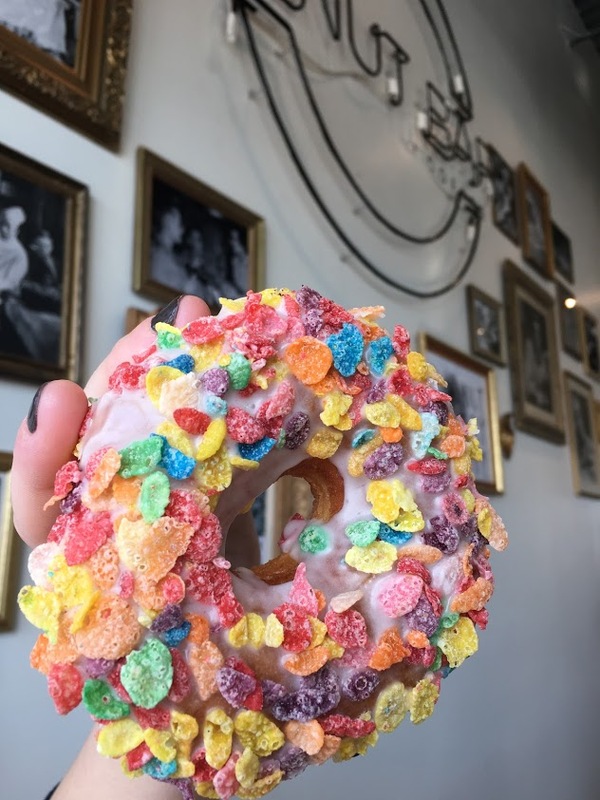 The fruity pebbles are such a creative idea and made the donut really colorful and eye-catching. Taste: Delicious! It was my favorite donut that I tried when I was there; I really loved it. It had the perfect mix of sweet and crunchy. OMG Factor: The fruity pebbles on top. 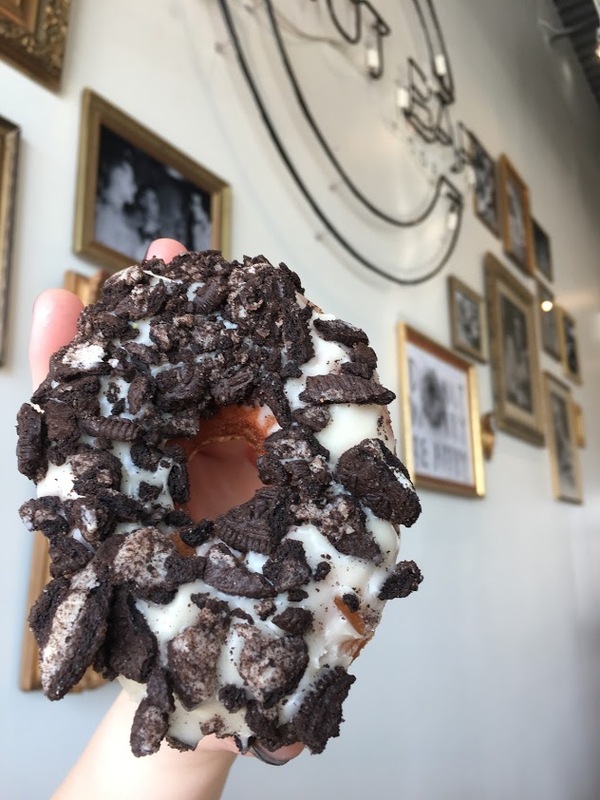 The cookies and cream donut was covered in crushed Oreos. Presentation: Cute presentation, but one you would expect from a cookies and cream donut, Oreos pieces and cream. Taste: Overall I thought it was pretty good. You could definitely taste the classic Oreo flavor, but it was a tad bit too sweet for my liking. Presentation: Pretty plain, just regular glaze on top, but you can’t expect anything too fancy from a regular glazed donut. Taste: It was amazing! Tied with Fruity Pebbles for my favorite. I would buy a box of a dozen of just this donut they were that good and had the perfect amount of sweetness. When it comes to classic vanilla glazed donuts, I always compare them to Krispy Kreme, who is the queen of glazed donuts. This donut definitely delivered and, in my opinion, was just as good as Krispy Kreme. OMG Factor: All of it! The inside was filled with the same cinnamon flavored filling. Presentation: The cannoli cream on top of the donut definitely reminded me of a cannoli right of the bat which was great because I love cannolis. The cinnamon dusting and the chocolate on the outside made it look more aesthetically pleasing. Taste: I thought it was pretty delicious! It definitely tasted like a cannoli, which again I was fine with because I love cannolis. There was a lot of cream inside the donut, and I mean a lot (I felt like I got more cream than an actual donut) but strangely enough, it works. It wasn’t too sweet and delivered the cannoli flavor I was hoping for. I would probably order it again. The donut was filled with a strongly flavored cream. Presentation: I thought the pink cream on top of the donut was really cute as well as the raspberry on top, but it just seemed pretty plain. I was hoping for something a little more? Maybe some more raspberry instead of just pink cream. Taste: It was pretty good to me, I know Murryum doesn’t like it because she thought it tasted artificial, which it did a little bit and I can see where she is coming from. But just because it may taste a little artificial, I won’t give it a low grade; I’m judging based on the taste and artificial tasting things don’t necessarily taste bad unless it tastes extremely artificial, which it didn’t. 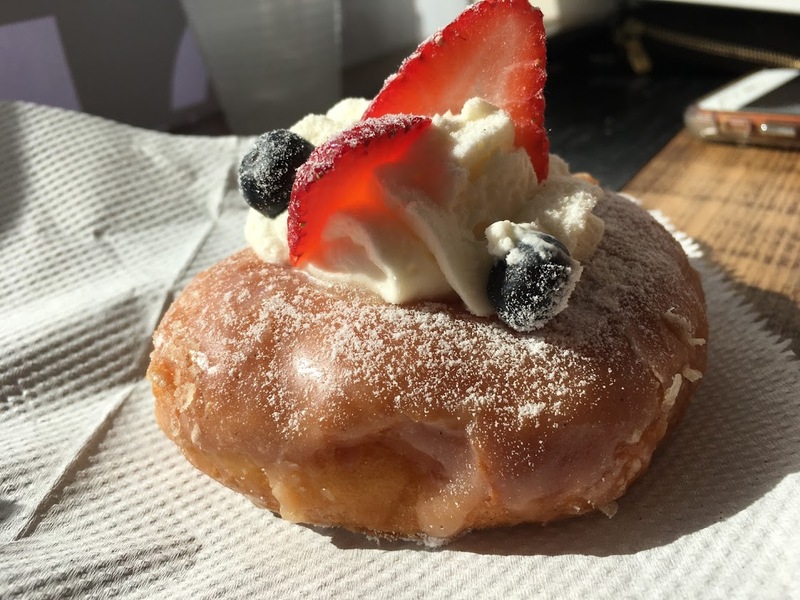 There was, like the cannoli donut, a lot of cream cheese (and I mean a lot). But again, like the cannoli donut, it worked. This was a raspberry cream cheese donut so it’s not a bad thing that the donut had a lot of cream cheese. This donut isn’t for everyone though, the massive amounts of cream cheese is an acquired taste.